Good day kinnies, a short intro to what to do and what to get in the new U22 area. if you don't have it and you can start the allegiance content, Join the faction through the Allegiance Panel and talk to a dwarf at the black gate and take the goat to Erebor right by his side, continue and finish the 1st chapter and it will grant you with a free port to Erebor. So if you need to get somewhere in that map, port to Erebor and from there take the horse to where ever you need. Starting with the 5th chapter of the Black Book of Mordor which will start at The Black Gate of Mordor and will lead you into Mirkwood (the level 65 area). You will need to complete the Mirkwood intro in order to get to there, the intro will start at the harbor south of Caras Galadhon. When you get to Northern Mirkwood you need to travel to Felegoth and talk to Thranduil, Which will give you a wrapper quest in addition to some other quests, which will lead you further in the areas of the map. Usually you will see a red comment in the quest description telling you to complete a certain quest chain. Each of the factions gives different barter items. The Dwarves of Erebor give Heavy gear. Elves of Felegoth give Medium Gear and Men of Dale give Light gear. So depending on you class, you will prioritize the relevant reputation. I will highly recommend using a reputation acceleration tome to double your reputation with the three factions, since you don't get much from quests. Even if you finish all of the quests and deeds you will still need to get more reputation in order to get the Kindred standing. Also, do all of the quests you can find, since you will need a lot of tokens of the lake and rivers (area currency) to barter for the various gear/essence crafting ingredients. So another thing you could do is Hand daily tasks at the task board. Eventually, when you finish the wrapper quest chain, you will get a deed done, (something about being summoned by the queen regent of dale), confirming your access to the daily quests. 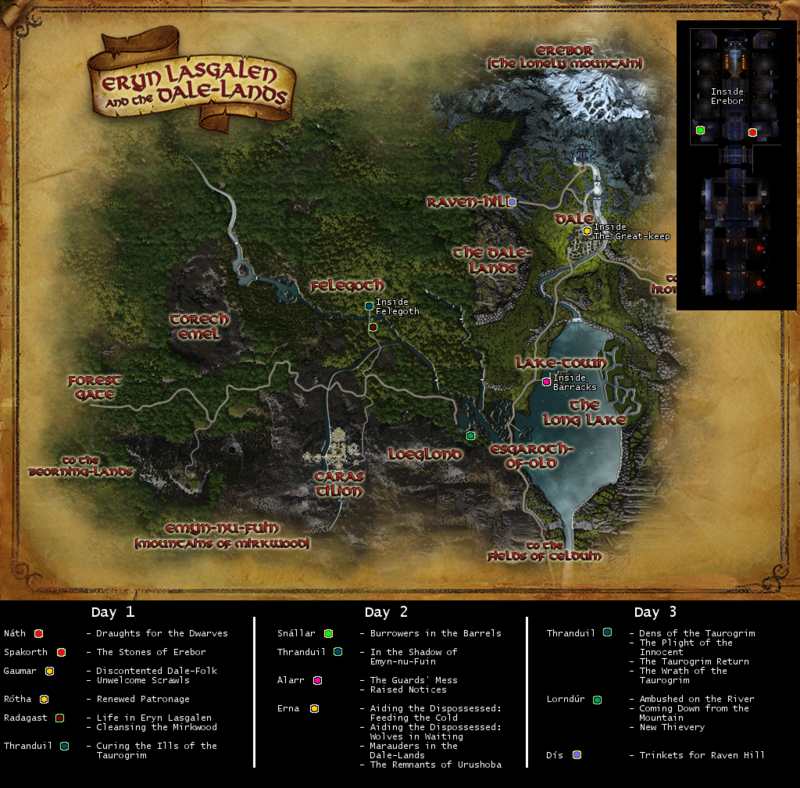 You will get a wrapper quest with a 3-day cool down, to complete 8 quests around the main area hubs. Every day you can do 8 quests, so you could choose the 8 quests you want to do during these 3 days to get the reward. That said I would recommend doing all of the 8 per day quests, since all of them give you the relevant faction reputation and 1 token of the lake and rivers. For the quests to count for the wrapper quest, you must take the wrapper quest from one of the quest givers (Thranduil/Thorin/Erna/Lake town). If you fail to take the quest and complete the daily quests, they will not count for the wrapper quest! Also when you finish the wrapper quest, you will gain access to a new episodic content which starts with the Queen Regent in Dale. In addition to the tokens of the lake and rivers you get from the quests, if you do the scourges of the north, you can get up to 9 tokens of the lake and rivers (3 tokens for each of the scourges). 1. 5 doomfold processed ingredients. 2. 1 Special doomfold processed ingredient (18 hour cool down). 3. 3 Malleable Shadow essences. 4. 1 Lasgalen Purification Token. How to get Malleable Shadow essences? You can barter them at Udun or any of the hubs in the new area. 1. Empowered Shadow Essence -> 1 Malleable Shadow essences. 2. Abyssal Essence -> 2 Malleable Shadow essences. 3. Empowered Abyssal -> 3 Malleable Shadow essences. If you already have the raid Abyss of Mordath gear, you will not be needing this gear, and going for the essences only, maybe the earrings and the pocket/necklace recipes if you are min/maxing. Since update 22.1, you can buy the new gold Northern essences for ash, it will cost you 2500 ash, so if you have a stockpile of ash, it is more profitable to get the essence with ash. If I've missed something, or if you want to contribute to this article please leave a message bellow or contact Frooka, so I can update this guide accordingly. The book of Mordor gives you a Chest, Cloak, 1 trait point and an emote. The epilogue of the wrapper quest will gives you leggings (Look for dragons quest). Do the Secret event that was introduced (21st of March) After completing the wrapper by reading a book in Thorin's hall, go to the 2nd floor in the left side of the area and look for a book on the bench. Note that you will need to complete the quest Introduction to the northern kingdoms in order to unlock that quest chain. This quest chain is recommended for heavies, since dwarf reputation is very sparse, and it gives a lot of it. Also it gives a lot of tokens of the lake and rivers and will reward you with a Goat.